After five years of intensive R&D and testing we began selling these units in late 2015 and now have six in service in several world class facilities including Capitol Records, Kevin Gray's Cohearent Audio, and several others. The Disc Computer is a complete servo control system that interfaces with any Neumann VMS 66 or VMS 70 lathe. It controls the Neumann pitch motor and cutterhead depth systems with outstanding accuracy, allowing the engineer to cut 33 and 45 RPM masters with louder levels, longer side length, and greater freedom with extreme low frequency and out of phase material. Installation is simple and can be done by a technician in about one day. Once installed, the Disc Computer itself operates fully in the background as a "black box", with no need to operate or adjust any controls on the unit. Cutting operations and procedures are exactly the same as with the original Neumann computer. 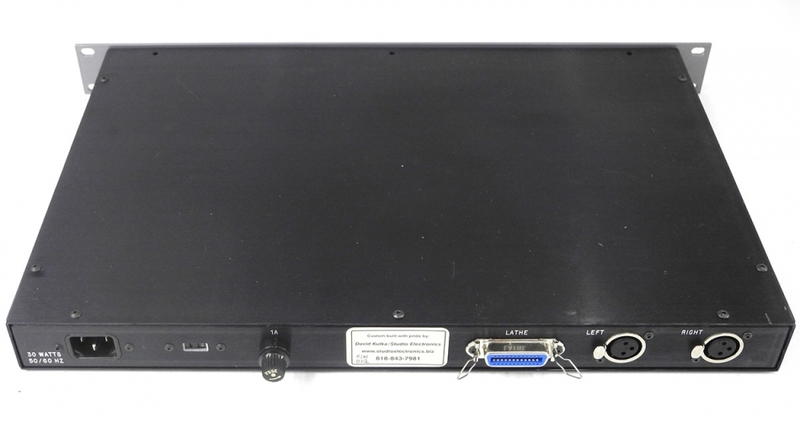 The Disc Computer is 1 rack unit (1.75") high and operates on 115/230 VAC, 50/60 Hz. It is lightweight and produces very little heat. It can be installed anywhere and once it is set up, no access is needed to the unit at all. The rear panel has balanced +4 XLR input connectors for the left and right preview signals. (Preview time is 1.08 seconds for 33 RPM, 800 milliseconds for 45 RPM. It includes an A-D section, a microprocessor section, and a D-A section. Unlike the Neumann analog computer, there is no need to connect the left program input.) The unit uses an inverse RIAA network and phase sensing to calculate groove space and depth requirements 16 times per second. The resultant LL, LV, and V DC signals are routed to the Programmer socket in the lathe, and calibration is performed on the Neumann Programmer Plug, as is done with the Neumann computer. The unit also received status signals from the lathe for speed selection, base pitch, and Stop / Run status. A 24-pin Amphenol connector at the rear mates with the interface cable (included), which is connected to two of the Tuchel panels at the rear of the lathe, and one Tuchel connector in the pitch control housing. A "dummy plug" is also included, which allows use of the original Neumann computer. The front panel has two displays along with 6 push buttons and a menu knob, which can be used for initial calibration and set up. The few settings and user options are permanently stored in non-volatile EEPROM memory, and are always saved during power down. The left hand display shows the speed that has been selected by the Programmer Plug; the right hand display shows menu settings, user options, and calibration info. The unit runs very cool and has no fan. The interface cable is identical to the well known Zuma system system n use at many mastering facilities. If you already have a Zuma system, you can simply plug your existing interface cable into the Disc Computer, perform a few simple calibrations, and begin cutting. If your lathe still uses the original Neumann analog computer, upgrading to a Disc Computer will yield immediate, radical improvement. The unit samples 16 times per rev versus 4 with the storage capacitor based Neumann analog computer, so the more frequent LPI and groove depth updates result in much more efficient groove nestling. Also, the Disc has far greater head room than the Neumann or Zuma systems. In addition, the unit has higher maximum output voltage (18 volts versus 12), and extended low frequency range, allowing accurate cutting or program material down to 15 Hz. Also, because of the gain structure and calibration procedure, several db of headroom are preserved, compared to the Neumann and Zuma systems. The result of all this is that you'll probably be able to cut 1.5 to 2 db louder, cut sides that are several minutes longer, and will be better protected against overcuts and lifts when cutting challenging program material. And while the Neumann system is generally quite dependable, the Zuma systems, which are based around an early buss computer, are often quite unreliable and intermittent. So if upgrading from a Zuma system to the Disc Computer, reliability will be greatly improved and downtime will be much less of an issue. Included with the Disc Computer is a detailed owner manual. The manual includes detailed instructions for lathe modification, installation, and calibration, along with a theory of operation section and a complete schematic. We also include a CD with a series of test tones and pulses that are used for calibration. The CD also includes a test track that can be used as a final test to check overall efficiency of the system, and LPI and groove depth performance. Also included is an interface cable (normally 25' but up to 100' upon request), a dummy plug to restore operation of the Neumann computer, and small packet containing 1 capacitor and several resistors, which are used when modifying the lathe. The unit is fully guaranteed for one year. Expert telephone and email support are available through David Kulka of Studio Electronics.. We realize that for a major upgrade like this most users will have some start up questions -- we will go out of our way to address any technical or operational questions. All units in service have been extremely reliable, but we keep a new unit on hand in case an emergency exchange is needed. On site installation isn't included, but is available at an extra charge. For details, please contact us. But in general, installation is not very demanding and can be performed by any engineer with moderate technical experience if the work is performed carefully. The manual explains all the steps clearly, and we are available to provide phone support during the procedure. If you like to download the Disc Computer owner's manual or just browse through it, you can access it here. There's more info about the Disc Computer on our web site here.